Riattivata/riammodernata la linea Rajin-Tumangang-Khasan, che collega Corea del Nord e Russia con 54 km a doppio scartamento (quattro rotaie per binario, perché la differenza troppo piccola fra 1435 e 1520 non permette l'uso di binari a tre rotaie). Transport secretary Patrick McLoughlin announced that Arriva has won the new Northern franchise while FirstGroup has won TransPennine. The new franchises are due to start on April 1, 2016. Il regionale 4835 e' deragliato stamattina tra Biella e Novara a causa di una frana. Un'altra buona scusa per chiudere l'ennesima linea in Piemonte? Piove, giunta regionale ladra! ovvero: Gombloddo! No. Nessun complotto. Ma quante volte hanno utilizzato interruzioni o semplicemente il degrado della linea per "sospendere" il servizio? Quasi mai: le linee "sospese" erano tutte in ottimo stato (tranne una), alcune avevano anche l'armamento nuovo. L'Amministrazione serba starebbe considerando di istituire, con un convoglio di fabbricazione russa (in livrea dedicata), un collegamento regolare con Kosovska Mitrovica; in febbraio se ne deciderà, dopo una fase di prova, il futuro. A Pristina si è mediamente entusiasti dell'idea e della livrea, mentre a Belgrado si ritiene che non vi niente di male nel raffigurare beni culturali patrimonio dell'umanità. Serbian authorities have sent a controversial train to north Kosovo, despite protests from its former province. 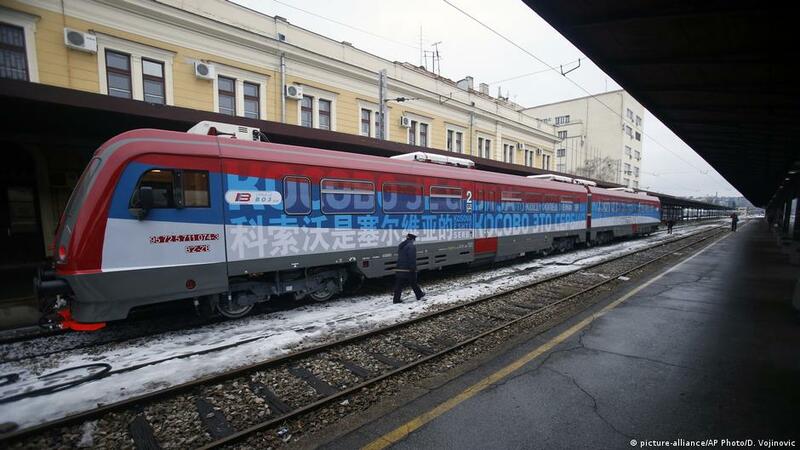 The Russian-made train is inscribed with words "Kosovo is Serbia" in 21 languages, including Albanian. Belgrade is considering setting up a regular railway line to the Serbian enclave in Kosovska Mitrovica, said Marko Djuric, head of the Serbian government office for Kosovo, on Saturday. Djuric was speaking at a promotional event for the line, sending off the specially designed train on its first official journey to the former Serbian province. The move sparked outrage in the mostly Albanian-populated Kosovo, as the outside of the cars is painted in Serbian national colors and bears the slogan "Kosovo is Serbian" in 21 languages. Inside, the carriage walls display medieval frescos from Serbian-built Christian monasteries in Kosovo, which today is predominantly Muslim. Serbian official Djuric, however, said that the choice of decor should not be an issue. "I don't know why anyone would view these images, which are part of the world's cultural heritage, as a provocation," he told reporters. The Russian-made train was set to travel through Serbia and north Kosovo for more than 10 hours, with Djuric's deputy and the director of the Serbian national railway company on board. During the journey, the passengers would be attended by hostesses wearing Serbian national colors. Belgrade withdrew its army and police from Kosovo after a bloody war in 1999, that ended with the NATO bombing campaign against Serbia. Pristina declared its independence in 2008, backed by the US and most Western countries. Serbia rejects the move and insists that the state is still a part of its territory, with its traditional ally Russia supporting the stance. China also opposes Kosovo's independence. With the EU mediating in the dispute during recent years, Belgrade and Pristina have managed to sign an accord aimed at normalizing relations. The tensions, however, remain high. Kosovo State Minister Edita Tahiri, in charge of negotiating with Serbia, urged the EU and the international community to stop the "illegal" train from Belgrade, deeming it a "serious provocation." "Serbia has a dangerous plan that should worry all of us, Kosovo as well as its international partners," she said on Friday. "This provocation displays the aggressive Serbian policy that jeopardizes the sovereignity and the territorial integrity of Kosovo, and its national security as well." Serbian authorities aim to test out the new line until the end of February, and subsequently decide if it would enter the regular train schedule. Verrà mai il momento in cui qualcuno penserà di ripristinare una relazione ferroviaria tra Italia e Slovenia? C'è ancora il regionale sloveno da Villa Op.? S-Bahn wrote: Verrà mai il momento in cui qualcuno penserà di ripristinare una relazione ferroviaria tra Italia e Slovenia? Speriamo, ma per onestà va detto che i treni internazionali sono in declino un po' ovunque, a causa delle regionalizzazioni, delle liberalizzazioni e delle linee ad alta velocità.